Here are my latest reflections on the Heidelberg Catechism in honor of its 450th anniversary. (For some background and the entire document, check this out). Q. 83. What is the office of the keys? A. The preaching of the holy gospel and Christian discipline. By these two means the kingdom of heaven is opened to believers and shut against unbelievers. All of us have misplaced our keys at some point. Usually it’s just an embarrassing inconvenience, though it may also prevent you from being somewhere you desperately need to be, which may bring all sorts of other consequences with it. What happens when the Church misplaces her keys? Or, perhaps before we get to that, what are the her keys? We’re not talking about the little piece of metal that I have on my key chain which enables me to enter the building where our congregation gathers to worship. Instead, we are trying to understand what Jesus meant when he said to Peter, “I will give you the keys of the kingdom of heaven; whatever you bind on earth will be bound in heaven, and whatever you loose on earth will be loosed in heaven” (Matthew 16:19). While the Roman Catholic Church has understood the “keys of the kingdom” to be intrinsically tied to Peter’s person (and, by extension, the priesthood), the Reformed understand this very differently. The “opening and closing of the kingdom of heaven” is not something tied to any person but to the proclamation of the gospel and the call to discipleship that accompanies the gospel. I find this set of questions and answers to be quite powerful and, to be frank, somewhat troubling. Here’s why. When we proclaim the gospel, announcing to people that “with true faith all their sins are truly forgiven them by God for the sake of Christ’s gracious work”, we are, the catechism says, “opening” the kingdom of heaven to them. That is to say, we are heralding the salvation that comes by grace alone through faith alone in Christ alone. Those who repent and believe are “heirs of God and co-heirs with Christ” (Romans 8:17). This is exciting stuff. Those who do not repent, however, remain subject to “the wrath of God and eternal condemnation”. The kingdom of heaven, in other words, is “closed” to them through their rejection of the gospel. This is sobering stuff. Of note are the specific means that the catechism ties to enacting discipline. First, it is to come informally, from the lips of brothers and sisters who know you and are sensitive to your struggle. If that call to repentant discipleship is rejected, then those ordained by the church (ruling and teaching elders) are to approach them for the same purpose of lovingly and prayerfully restoring them. If that, too, is rejected, then they are to be excluded from participating in the sacraments until such time as they do repent and “show real amendment”. (Compare this to Matthew 18:15-17). The Church cannot misplace her keys, as it were. She cannot cease to proclaim the saving death of Jesus Christ and call people to repent and believe. She cannot cease to lovingly and consistently call believers to a life of faithful discipleship. 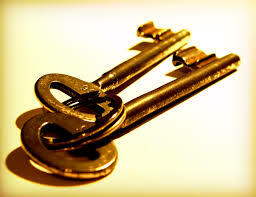 She cannot cease to use her keys to open and close the kingdom of heaven.